Important note: this book is not available from Amazon.com. Inserted title links refer to ordering instructions- please see bottom of review for full info. Byzantine Churches and Monasteries of Crete is a lovingly prepared and fully illustrated book, and not merely a documentary collection of churches on Greece’s biggest island; much more than that, it tells the spiritual history of Crete, weaving together legends, myths and vivid historical facts into a narrative that both recounts and guides. It is thus both a wonderful book to browse while at home, and an indispensable companion for travelers headed for Crete and interested in the Orthodox heritage, so vital to Greece and its people. Byzantine Churches and Monasteries of Crete benefits from the local expertise of historian Nikos Psilakis, and its wealth of glossy color photos that depict churches, monasteries and the frescoes that adorn them – as well as vintage shots of monks ‘in action,’ ringing bells, perusing manuscripts, and appearing otherworldly beneath long white beards. 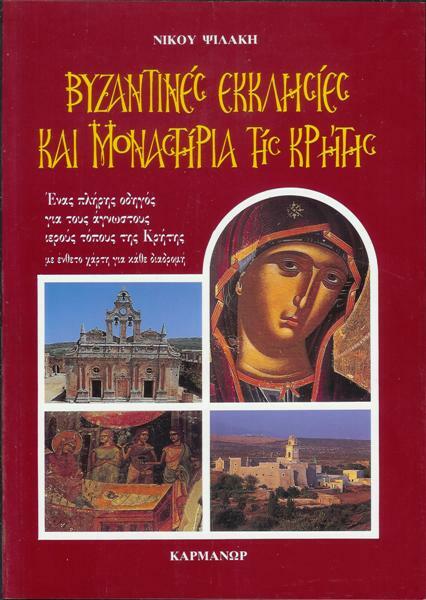 The book was put together with the help of the Archbishopric of Crete, and the author was thus granted unique access to almost all of the monasteries (many of which are well off the beaten track and rarely open) as well as their movable treasures. While it has over 200 pages, the book comes in a handy paperback format (24x17 cm.) and is thus a portable guide that travelers can easily bring with them to Crete, set in a durable binding containing all glossy pages throughout. Byzantine Churches and Monasteries of Crete is thus an elegant item for the home bookshelf as well as a sturdy companion for travelers. A real benefit of the book is that the author not only provides detailed descriptions of the churches and monasteries, he also provides walking directions within the sites to make sure you don’t miss the important things. He also provides 16 optional tours all around the island which connect the monasteries in an efficient manner, and the fold-out map on the last page of the book, complete with all the monasteries described as well as the major towns and villages of Crete, also provides a helpful reference for visitors to get their bearings. Before getting into the major portion of the book, author Psilakis provides an indispensable short overview of the history of Cretan spirituality and in indeed the island from the time of Zeus’ birth in a cave on the celebrated Mt. Psiloritis (2,456 m) through the Byzantine period, the brief period of Arab control, the renewed rule of Byzantium, and finally of Venice, the Ottoman Empire and modern Greece. This introduction thus provides a succinct overview of Cretan history for those visitors who may not know much about the island and its rich history. Finally, the author devotes 3 pages to the Historical Museum of Crete in Heraklio, detailing its rich collection of ecclesiastical art, ancient coins and jewelry, works of art by the likes of native son El Greco, examples of clothing and other traditional Cretan items, as well as a full model of what Crete’s capital looked like in the 17th century. The introduction also discusses icon collections and contemporary churches of Crete before continuing on to the main section of the book. As the author relates, Crete boasts over 800 frescoed churches, and therefore, “it is impossible to visit them all.” Byzantine Churches and Monasteries of Crete thus concentrates on the top 137 – in any case, many more than most visitors will have time for. In all cases, the author provides detailed information in clear and straightforward prose regarding the history of each structure, to the extent to which it is known. Indeed, many of the older churches and monasteries have their roots in the distant past, and date back well over 1,000 years. But the scarcity of information in some cases only adds to their mystique. Two other famous examples of Cretan spirituality, though vividly contrasting, are the Monastery of Chrisoskalitsa and the Monastery of Arkathi (Arkadi). The former, a sublime contemplative space located on a sheer cliff above the sea, on the southwestern extremity of the island, has (or had) according to legend a golden step (p. 142). Now this whitewashed, elegant structure is inhabited by a few monks, its location attesting once again to the Greek appreciation of harmony with nature when choosing their locations to build churches. As for the former, Arkadi is revered as the site of a seminal moment in modern Cretan history (p 156). In November 1866, 900 Cretans, including 600 women and children, took refuge in the church in the face of 15,000 Turkish besiegers. Rather than face torture and death at the hands of the Turks, the Greeks inside set off massive stores of gunpowder- killing themselves and hundreds of Turkish soldiers at the same time. Says the author, “that incident is regarded as one of the most important ones in the modern history of Crete.” Today, the monastery is fully restored, replenished with flowers and purring cats. The Monastery of Gdernetto (Gouverneto) on the northwestern Akrotiri Peninsula is another standout monastery with unique stone carvings and a cave church nearby where hermit monks lived since Byzantine times (p. 121). In fact, it is associated with the cult of St. John the Hermit and inhabits a beautiful craggy spot on one of Crete’s isolated promontories. Gouverneto’s cave church, Arkouthiotissa, is also marked by legends that are both unique and exemplary of similar traditions throughout the monastic world – and no less significantly, which show the continuity with Greece’s pagan religious past. However, there’s more to the legend than this: as the author recounts, the ancient Greeks used to venerate the goddess Artemis – in the form of a bear – in the cave. And even after faith in the ancient gods “had faded,” the locals continued to treat the cave as sacred. The feast day in the Orthodox calendar- February 2 – also happens to coincide approximately with the ancient celebration day for Artemis. Many other legends and tales are identified with monasteries in Crete, as are historical accounts. The most vivid of these recount, as with Arkadi, the repression and bloodshed of the Ottomans following the frequent revolts of the feisty Cretans, especially in 1821 and 1866. However, no matter how many times the Turks butchered the monks and razed their churches, the insuppressible Cretans were quick to rebuild them. Yet other legends exist attesting to more distant periods, such as that of the Venetians (1204-1669) and the Byzantine ages before that. Some of these tales are told in the context of the individual churches and monasteries, others in the author’s brief survey of the history of monasticism on Crete (pp. 26-31), which also provides helpful distinctions between the two types of monastic life, the communal and solitary (coenobitic and idiorrhythmic). Finally, the photos and documentation of ecclesiastical art and jewelry attest to the Cretans’ historic creative powers, which due to the primarily religious direction of society found their primary expression through ecclesiastical art. Ioannis Kornaros and the great El Greco are two of the most famous painters mentioned, but numerous other anonymous frescoes also attest to the distinctive style of the ‘Cretan School’ of painting, marked by its expressiveness and sensitivity. The mixed tradition that grew up following the Venetian conquest of 1204 resulted in a unique combination of Italian and Byzantine influences, which helped create a paradigm for Italian Renaissance painting of the 15th century. Not incidentally, artistic Cretan calligraphy also contributed to the rise of printing in the West, the most famous example being Markos Mousouros, type designer for the legendary Aldus Manutius, 15th century humanist and the first great book printer of Greek and Latin classics. Crete also produced intellectuals, all of which received strong education via the schools and learned monks, most notable being the fiery polemicist and intellectual Georgios Trapenzountios. The author Vitsentzos Kornaros also produced the best-known work of Cretan literature, the Erotokritos. Thus it can justifiably be said, as scholars have long attested, that a veritable renaissance occurred on Crete parallel with the Italian one. To conclude, Byzantine Churches and Monasteries of Crete is a beautiful and informative guide to some of Crete’s most important cultural places. Visitors to the island seeking to appreciate its history will do well to start here. The book is succinct, concise and straightforward, and most importantly, recounted by a local expert active in the fields of history and archaeology. It is a better choice even than the celebrated Blue Guides, being better illustrated, a quicker and more informative read, and just as portable. All visitors to Crete should come equipped with the book and, even for you armchair fans of Greek culture and the Orthodox tradition, reading the vivid accounts and fantastic photos will inspire you to make the trip to Greece’s biggest and best island. Byzantine Churches and Monasteries of Crete is not available on Amazon.com. You can buy it safely, quickly and easily online, through the CretaShop website.